Why Choose a Custom Frame. Most experienced riders will try to offset this by investing in a good Bike Fitting – however your optimal position will still be limited by the Angles and Dimensions of your current Frame. Everyone knows that for people at either end of the leg length range, a stock bike can’t provide a good fit, simply because stock frame sizes will be either too tall or too short. What is less well known is that those of us with common leg lengths can easily have body proportions that vary quite far from “average” proportions. Body proportions often vary by more than the adjustment range of saddles and handlebar stem lengths. Custom Frame Builders design bikes to fit riders, matching their size, proportions and riding needs in one package. I would recommend everybody to get a proper Bike fit done , and to try to match the results to any off the shelf frame. We can build a Frame for you from top quality Steel or a Steel / Carbon mix. In recent years we have seen major advances in Steel tubing. 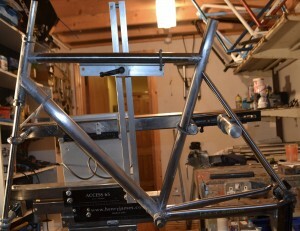 Custom Built Steel frames can now be built almost as light as the lightest carbon frame. 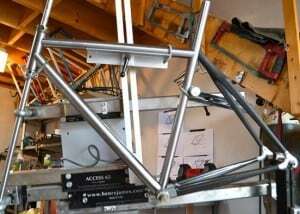 In the ever evolving world of Bicycle Frame Material – A Custom Lugged Steel Frame is becoming an exotic sought after item. • Tensile strengths of steel bicycle tubing have doubled in the last few years, leading to lighter and livelier, and most importantly, more comfortable frames. • Aesthetically and technically superior brazed lug construction can only be used for steel frames. Steel lugs reinforce the joints allowing lighter gauge tubing. This leads to longer lived frames and a more responsive ride. • Steel has a higher density than other frame materials so it provides a more lively ride and better feedback when riding at close to the limit of traction. We start by talking to You the rider, determining what you expect from your new frame , and your intended usage. 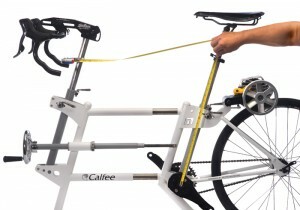 Our Custom Bike Fitting will determine your perfect Frame Dimensions. We follow up the ‘Bike Fit’ by setting you up on our Sizer Cycle in the exact position and Dimensions of your new frame. Advice on subtle changes are made at this stage resulting in a Frame Design that has had as much input from You the rider as possible. Once we decide on Frame Materials / Tubing , we can advise on a Completion date. The customer can visit the Design Center to check on the progress of his/her frame at any time during the production process. A time served Fitter, Brendan Whelan continually up-skilled throughout his career in Engineering and Supervised a busy Engineering Dept for a US Multi National Company for almost 18 years. Brendan has been involved in the Irish Cycling scene for almost 30 years – In that time he has been a Rider, A Coach and Manager at Elite National team level. A multi National Medalist & Champion, he continues to race at the highest domestic A1 Level. Brendan has been studying Framebuilding and Bike fitting for the past few years both at home and in the UK. 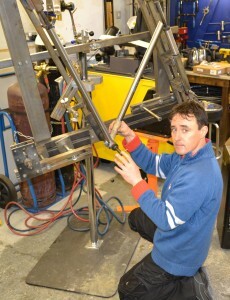 He now works from our workshop (Bicycle Design Centre ) in Naas town, Kildare.